This week is my very good friend D’s birthday. One of those birthdays when you have a party and everyone comes over to celebrate a new decade. D invited all of us over last weekend and I made the long drive (snowing on the way down, icy on the way back, of course). Totally worth it – not just for the New York bagels, but for the company and for the glimpse of a younger D that we got to see, enshrined in shaky, sometimes fuzzy video footage of a 1980s TV show on which he ‘guest starred’ (for lack of a better term, and to protect anonymity). Seeing thirty-years-ago D, with the same gestures, mannerisms, deadpan matter-of-factness, and perfect comedic/sarcastic timing was absolutely priceless. I mean, who can get a whole room laughing hysterically at age 11 just by saying, “I didn’t do anything” at exactly the right moment? We are who we are. Spending the weekend with old friends – now dispersed all over, and all far from where we started, each in careers or with hobbies or lifestyles we would never have guessed for each other – I was struck by how exactly the same everyone is, in all the right ways. Which is as good a place as any to segue into cabin-land. As you might guess, not a lot of building this week – it was mostly driving. We drove a lot this weekend too – but it was cabin-related (as well as celebrating another January birthday). We headed out to a cedar yard, to pick logs to replace those that had disappeared or are steadily disintegrating. We worried that they would look too shiny and new. Until we got there, and, prying them out of an icy pile in the freezing cold wind, we saw that they looked oh-so-familiar. The cabin will be 85 years old – we think – this year. Its old logs are probably over 100 years old. And these little whippersnappers are barely pushing 20, if that – but there they are looking just as full of character, steadfast, and sturdy as the old ones. Double-dare us to install them? Not your typical log truck. It (mostly) warmed up this week, so we got a good bit done. We are still in the midst of the Frame-A-Thon – trying to get all our walls up so we can pull wire so we can get some insulation up in here. Over the past few days we (bought a lot of 2x4s and) framed the first floor, plus all the way up to the roof in the closet. A few more of the upper sections, some minor design work to figure out, and a few more good weather days and we’ll be done framing. Too bad we’re back to our day jobs this week – back to the slower-paced weekend schedule. View from the front door – all the way through to the back, as it should be. And by the end of the day, framed all the way up. Closet: done. Helper today. Now that the floor is closed up, our buddy can come hang out. With his personal heater and my extra fleece. Even though it was well over 40 degrees. From bedroom toward kitchen (on left) and shower/bathroom (on right). Despite epic snow/ice/rain shoveling and record low temperatures, we are moving forward. Shoveled, sanded, salted – AGAIN. 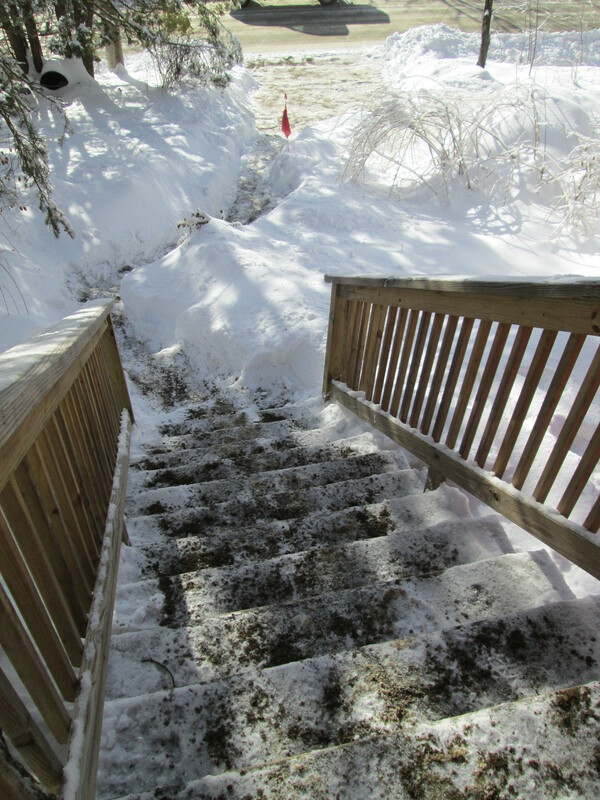 Even with the weather challenges, we did get some work done – some temporary, some permanent. More to come soon – we still have a couple of days of “winter break” left. And supposedly, temperatures that are reasonable to work in – maybe even the upper 20s this weekend! A red squirrel was hanging out in the cabin (we saw him run out twice!). He even decided that K’s tool pouch was a great place to store acorns. So we put down scrap plywood to completely close in the subfloor. Bonus: I won’t fall through to the cellar anymore. This was where we fixed the big hill in the floor last week. Looks good! Our plan this week was to build some walls! The weather has not cooperated – the one day warm enough to work was pouring rain. Stopped at the lumberyard anyways. 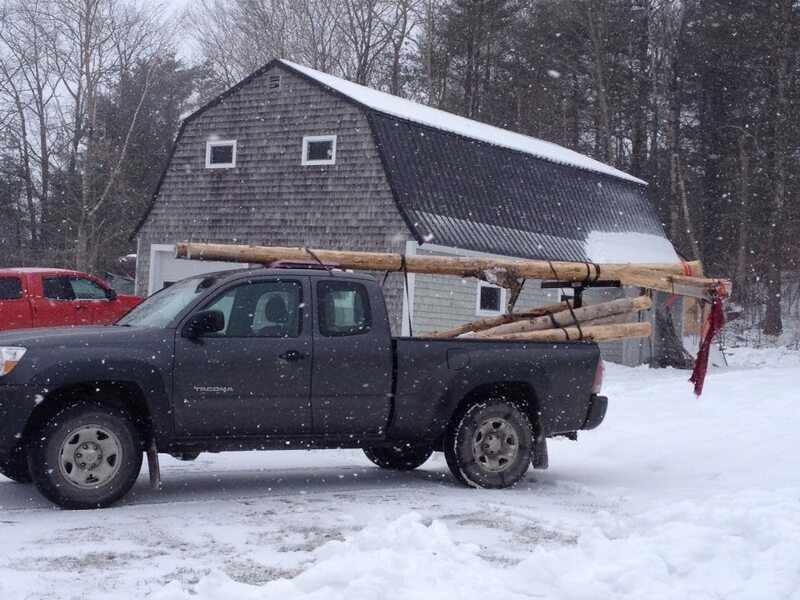 This dude was not too thrilled to load lumber with us. And then built our bedroom wall! The haze is because it was pouring rain on top of snow and ice, and humidity was insane! Everything was foggy. View from bedroom to front door. Perfectly centered. Ultimately, this will be where our French doors are.